The first trimester of my first pregnancy took me down. The exhaustion and constant nausea wrecked me so I did the best that I could to take care of myself. I rested and relaxed with my feet up and my Sea-bands on until I started to feel like myself again around week 12. The first trimester of this pregnancy was way worse and the ickiness lasted at least a month longer. I was more exhausted, more nauseous, and instead of getting to focus on taking care of myself, I had a two-year-old to deal with to lovingly parent. Tell your child to hide and take your sweeeeeeeeeet time finding her. 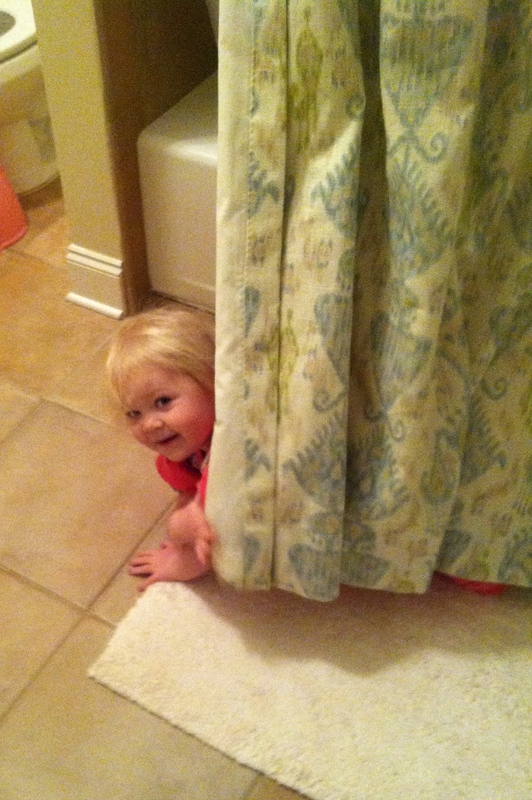 When it’s your turn to hide, really hide. Here’s how it works: Mother sits comfortably on the porch and eye spies an object way far away in the backyard. Child then has to find the object, go physically touch it, and then run back to mother resting on the porch. High five. Rinse and repeat. When I felt like crud, there were days when those hours between the end of naptime and the beginning of bedtime felt like they would never pass. On those days when we needed a little afternoon entertainment and weren’t fit to leave the house, we would have a party bath. I would set Harper up in our big bathtub with toys! and bubbles! and cups! and play the Frozen soundtrack. We would sing summer songs and pretend she was swimming in the pool. She would happily entertain herself in there until she was pruned from head to toe. This gave me at least an hour to lie on the surprisingly comforting cold bathroom floor. Win win. And what’s the best way to entertain a child—the way that requires minimal effort on your part and guarantees maximum enjoyment on theirs? Television OF COURSE! I know in some circles television may be frowned upon in the same way as formula feeding and high fructose corn syrup are, but ya gotta do what you gotta do. To my immense credit as a fully devoted and wholly attentive mother, Harper didn’t watch much TV until she turned two. She didn’t have the attention span for it and it just wasn’t a part of her world. These days, she would probably watch six straight hours of infomercials en Española if that’s what was on. She loves to watch damn near anything so it is important to me that when she does watch something, it is quality programing. And I’m here to say, there is legitimately good stuff out there. During my first trimester, I was phoning it in. And you know who stepped up and did most of the heavy duty parenting in my place? My husband. Daniel Tiger. Daniel Tiger’s Neighborhood is hands down, my favorite show for little ones. 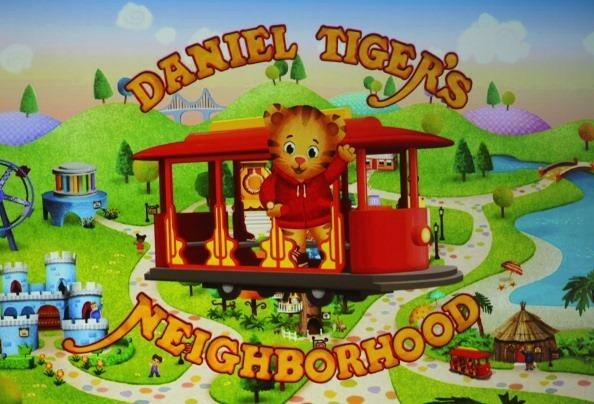 Daniel is a sweet and wholesome little cartoon tiger who, when confronted with the trials and challenges of being a little tiger in a big world, learns a catchy song and the appropriate way to behave. If you are having an issue with your child, I’m willing to bet that there is a Daniel Tiger episode to address it. Does your child have trouble sharing? There’s a Daniel Tiger for that. Does your child loose it when it’s time to leave the playground? There’s a Daniel Tiger for that. Does your child act like a barbarian at restaurants? There’s a Daniel Tiger for that. Picky eater? Afraid of the dark? Afraid of green vegetables? Irrationally impatient? Freak out when left with a babysitter? Only want to wear a tutu? There’s a Daniel Tiger for ALL of that. I literally look at the episode descriptions, find one addressing our most pertinent issue at the time, press play, and let Daniel do the talking. The show’s songs are short and snappy and outline the appropriate way to act. My Man and I often sing them when Harper needs a gentle reminder to “think about how someone else is feeling” or that “that was fun but now it’s done.” Classics like “if you need to go potty, stop and go right away. Flush and wash and be on your way” and “you can take a turn and then I’ll get it back” replay on a constant loop around our house. The show Super Why is a great intro to learning letters and reading, and Peg + Cat provides a fun look at numbers and basic math—but Daniel Tiger’s Neighborhood has my heart as far as teaching children about character and how to act like a decent human 101. So turn on the telly and let Daniel do the parenting while you take a nap. You deserve it. And since necessity is the mother of invention, I know this list will grow as our family expands in the next few months. In fact, I have a feeling it’s going to get downright desperate up in here when I am trying to keep both children alive and entertained. So please let me know what you do to entertain your little ones on an energy budget. Any games or toys that really go the distance? What TV shows do your kids watch that you love? I know I will need all the help I can get.